This page records work on the ship and some visitor occasions from her arrival at Gillingham Pier in November 2013. ​Progress was (and is) limited by available funding and a shortage of volunteers. Although it is not a "blog" as such you will find the most recent entries at the top. In May 2015 the Medway Queen attended a Dunkirk commemoration for the first time in many years. The ship was towed to Ramsgate by the tug, Christine, where she took part in the 75th anniversary events seeing the “Little Ships” off on their pilgrimage to Dunkirk and patiently waiting for them to return on the following Bank Holiday Monday. This expedition was only possible with the support of the The Gosling Foundation and other benefactors, to all of whom we are very grateful. In 1940 HMS Medway Queen operated out of Ramsgate for much of Operation Dynamo and landed troops there on five of her seven crossings; so it was fitting that she should be there again for this anniversary. A fund-raising initiative was launched in Ramsgate, structured around a display of 7000 AirfixTM model soldiers which could be “rescued” in return for a small donation. As in 1940 they waited patiently in line to be picked up from the “beach” although this time they were in the comfort of the ships aft saloon. The scheme is continuing after the Dunkirk event via a link on the society’s website and on board the ship at Gillingham Pier. The Ramsgate event was a great success from the Medway Queen’s point of view with donation levels high and thousands of the soldiers rescued although we did not come close to the original 1940 crew’s achievement! The BBC filmed on board Medway Queen for an episode of “Heirloom Detectives”. This was a follow-up to an Antiques Roadshow programme that featured the Grandson of Medway Queen’s captain at Dunkirk. The daughter of MQ’s 1st Lieutenant, John Graves, also took part in the programme and has loaned her father’s dress sword for display in the Visitor Centre. The programme was broadcast in April 2015. The Medway Queen Preservation Society (New Medway Steam Packet Co. Ltd.) is pleased to announce that the Heritage Lottery Fund (HLF) has awarded a ‘Transition Grant’ for 2015. After the success of the Medway Queen’s hull rebuild in Bristol, and the euphoria of the ship’s return to Medway in November 2013, 2014 was bound to be something of an anti-climax. The major funding from the HLF and the European Regional Development Fund had been used for its intended purpose but the project was now at an end. The society tried to maintain the momentum of the restoration with much appreciated support from Medway Council and the GMB Union but insufficient funds were forthcoming to keep even a reduced level of professional activity going for long and the workshop activity had to be reduced. This process was aided by the apprentices completing their training and moving on to full time employment. Bryan Hulley, MQPS Site Manager, reported that for the volunteers in the mechanical team the priorities have been the bow rudder and the main steering mechanism. The main steering mechanism needs to be installed before work can commence in fitting out the aft saloon. The steering engine is linked to the rudder by chains and cables running under the side benches and all components were reported as “on site” in October. The steering engine itself has returned from professional refurbishment by Westwell Developments Ltd. of Rochester. The bow rudder locking pin and bow steering mechanism have been installed and have been re-united with the wheel mounted on the fore deck. The replacement wheel has been generously donated by Mr. Bob Ratcliffe in memory of his son. The restoration priorities are the aft saloon and the engine room with its machinery. First of these must be the steering engine and its linkage to the rudder; as that runs through the aft saloon, under the side benches, and is best done while the space is clear. Work has now started on this thanks to generous support received from the Trusthouse Charitable Foundation. The society also announced another generous funding grant towards the cost of this restoration work by the Ironmongers’ Company. The photo (right) shows the restored steering engine ready for re-installation. A successful open weekend was held on 26th, 27th of April 2014. This relied on a great effort by many society members (thank you) but we must especially congratulate Brian Goodhew, Mark and Pam Bathurst and Roy and June Sedge for all their planning, organising and hard work on the day. Well over 400 people attended on the Saturday and were generous with their purchases and donations. On Sunday a smaller number joined us for a commemorative religious service including the laying of wreaths for the Dunkirk Veterans and worker members of the society who did not live to see the ship’s return. In 2010 the society obtained support from the European Development Fund towards the fitting out of the ship as part of the Interreg IVA "Heroes of the Two Seas and Heroes to See" project. A site was leased from Medway Council on Gillingham Pier in 2011 and a workshop set up. Four instructors and eight apprentices worked to provide parts for the hull build in Bristol and to prepare the site for the ship’s return. By the time Medway Queen returned to Kent most of those apprentices had completed or nearly completed their courses. Thanks to generous help from Medway Council and the GMB union we were able to retain two instructors for the short term until all the apprentices had left to take up "proper" employment. Medway Council has also given (and continues to give) valuable support in other ways. 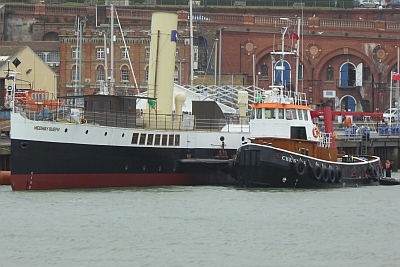 The Medway Queen was towed out of the Albion dry dock on 24th of October 2013 and moored up in Bristol’s Floating Harbour. A week later she was moved down to Avonmouth where she then waited with her tug for a 48 hour calm weather window to start her journey home. Conditions were right at last on Friday 15th November and Alan Pratt's tug, Christine, with PS Medway Queen in tow left Avonmouth in the afternoon bound for Gillingham Pier. The first available safe harbour was Falmouth, which was the reason for a 48 hour calm weather requirement, but in the event the journey was completed non-stop; arriving off Sheerness on Monday 18th November. On Tuesday 19th the Christine completed the last stage of the journey to the pier. Hundreds of people lined areas where they could safely watch and more crowded onto the nearby Strand and other vantage points to observe the proceedings despite the cold weather. The event was reported not only locally but also by both BBC and ITV television news.